Denmark's Iron Fire has been a band that has hovered on the periphery of the European power metal scene since its inception in the mid-'90s. An unsettled line-up and an identity crisis, each of which have been the deciding factor in many a band's demise, both plagued Iron Fire from the beginning and are without a doubt what kept the band from shouldering into the ranks of the genre elite. Frontman Martin Steene has been the only consistent member of the band, but with such a revolving door of cast members Iron Fire was never able to establish an identifiable sound. With Voyage Of The Damned, Iron Fire's seventh full-length release, Steene tries once more to secure a place at the power metal round table. Gone are the tales of warriors and wenches, as Voyage Of The Damned is wholly constructed around sci-fi themes and imagery. Gone too are most of the expected Euro-styled power metal trappings, with most songs having a dark edge and mid-tempo pacing. Guitarist Kirk Backarach infuses each track with a weighty, dominating presence through ample use of crunchy, sometimes staccato riffs. There's an overwhelmingly modern sound to his style that is reflected in his riff construction, though he proves more than able to set his strings aflame with frequent solos - the best of which occurs on the track "Taken". The contributions of Martin Lund on bass draw down Backarach's groove into truly menacing territory, and the four-stringer even breaks out with a bit of a lead on "Ten Years In Space". 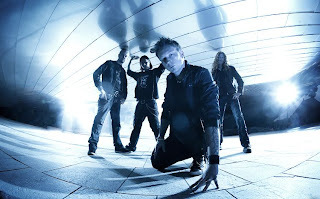 All of this combines for a modern heft that places Iron Fire more in the realm of bands like Iced Earth than Blind Guardian, which may be a pleasant surprise for long-time followers of the band. Steene also mixes it up vocally on Voyage Of The Damned, augmenting his clean delivery with occasional forays into more aggressive territory. Songs such as "Taken", "Slaughter Of Souls", and "Leviathan" feature brief snarls and growls during the choruses (those on the latter track courtesy of ex-Benediction/Bolt Thrower frontman Dave Ingram), while the very modern sounding "Ten Years In Space" and "With Different Eyes" contain more of a balanced mix between clean and barked vocals. This variety enhances the appeal of the album, being neither too extreme nor too "traditional". 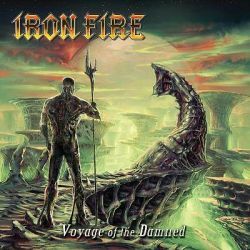 Even though Iron Fire's approach on Voyage Of The Damned is not typical of their European power metal peers, the album is not entirely without the familiar flair. "The Final Odyssey", for instance, is an epic ballad during which Steene delivers a rather theatrical performance. The song is, admittedly, quite intricately layered, but still a cheese-tastic ballad. The 10-minute title track pulls out all of the power metal stops and ratchets up the orchestration to exceeding heights, though a few growls do make their way into the mix. A prominent component of each song on Voyage Of The Damned is Rune Stiassney's keyboard work, which ranges from the Gothic to the Baroque and always manages to provide the appropriate type and amount of atmosphere. Voyage Of The Damned is a good power metal album from a band that desperately needs to latch on to a consistent sound. What Iron Fire has created, while not altogether groundbreaking, will unquestionably appeal to power metal fans who don't identify with the fairy-tales and fantasies the style is mostly known for. The only drawback is that little about Voyage Of The Damned remains after the last notes fade into silence. Forge those hooks, and Iron Fire will be the band that it has been struggling to be.